Sincerity of faith is not an inoculation against participating in evil. No one can really deny that Christians have supported and participated in very serious evils in history. At least some of these evils are now commonly condemned and seen as plainly non-Christian and against the teachings of Jesus. However, at the time, Christians went along with them, seeing nothing wrong. Anytime I have brought this fact up, Christians are quick to justify, explain away, deny or minimize the damage done by Christians. In the past, I have done so myself. These deflections are fairly shallow attempts to evade responsibility for the past behavior of Christians. Perhaps more importantly, this defense of past Christians helps avoid what owning these mistakes would call for: present introspection into the Christian community, that might reveal similar injustices in contemporary Christianity. Not only is this a logical fallacy but it is completely wrong. While spinning history this way may allow Christians to perpetually believe that we are the good guys/girls of history, it is dishonest and deceitful. It, like the picture of Columbus above, is a make believe picture of our past that paints a false picture of a much more complex and much darker reality. I say this because if we read the journals and writings of Christians throughout history, including the ones we know participated in injustices and evils, you will find sincere faith and orthodox theology and practice in many of them. This is a more accurate picture of the legacy of Christopher Columbus. 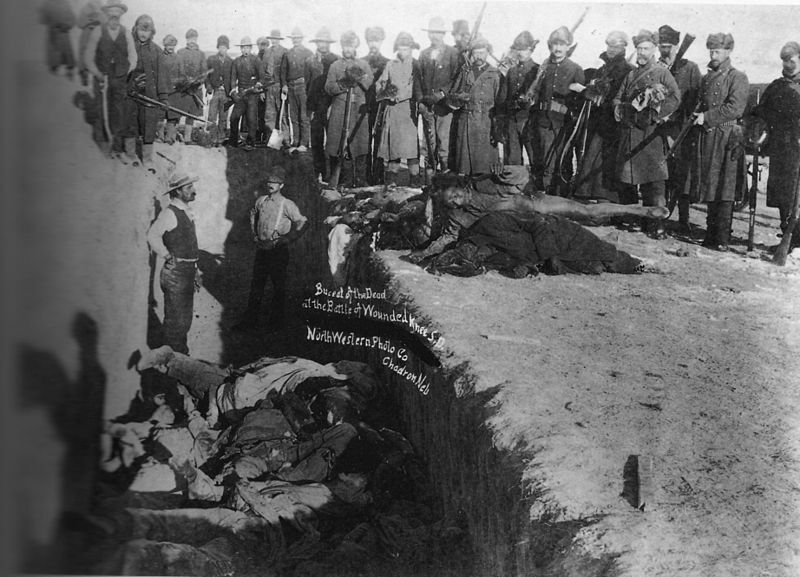 This is the mass grave at Wounded Knee. Columbus by this and other accounts was sincere in his faith, even to the point of not cussing. He was also completely for the exploitation of the new land and the enslavement of its people. “After returning to Spain and reporting on the incredible wealth in the islands of the ‘New World,’ the monarchs gave Columbus 17 ships and more than 1,200 men to plunder the Caribbean. His new expedition went from island to island gathering slaves and gold with unprecedented brutality. This devout Christian was completely fine with participating in these evils. To make it worse, Columbus did not participate in these evils despite his sincere faith, Columbus was rapacious in his desire to exploit the New World because of his faith. Columbus was not simply an imperfect and sinful but otherwise sincere Christian; Columbus was a sincere Christian, fully shaped by the faith and cultures of his day, and that is why he committed heinous evils believing himself to be righteous. Due to the colonization that followed Columbus’ “discovery” of America the Native American population which had been estimated to number anywhere from 90-112 million pre-contact was decimated to around 250,000 individuals at its lowest point. Entire tribes, languages and cultures no longer exist. 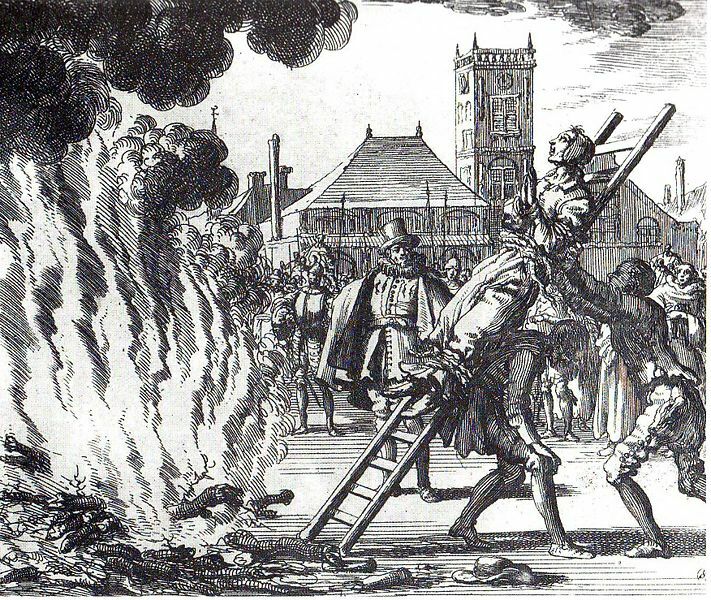 The burning of one Christian, the Anabaptist Anneken Hendriks, by other Christians, Spanish Catholics. During the Reformation, a time of idealized by many Protestant sects, Luther, Calvin and many other Reformers were clearly very sincere in their faith as were many of their Roman Catholic counterparts. Much of the current theology in Christianity is derived from these men or has developed in response to their thought. Many Christian sects have their origin from this time or owe their origin indirectly to its legacy. Some, such as Lutherans or those who declare themselves to be Calvinists or Arminian, even label themselves after leading theologians from the time. Many of the leaders of the Reformation also participated in and encouraged anti-Semitism. Some continued to approve of Christians serving in wars (even as mercenaries). Some persecuted and killed other Christians for believing the wrong things about God. Many of these attitudes and beliefs met with widespread acceptance not criticism. 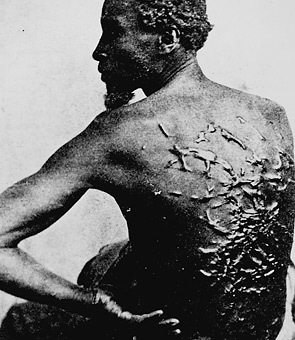 Some of the greatest Christian leaders of the day participated in and advocated for slavery. Skipping forward a few hundred years in history, during the Great Awakening in the Americas the Holy Spirit was being poured out and incredible changes were happening in the U.S. Meanwhile slavery was a reality that was supported or passively accepted by sincere and influential Christians. George Whitefield, the famous American evangelist and orator, advocated for slavery. Jonathan Edwards, who I myself admire in many ways for his faith and thought, owned slaves. The Methodist circuit riders, who died at the average age of twenty-eight because their zeal for evangelism drove them to brave the elements of the American frontier, owned on average eight African slaves a piece. This was a systemic evil that was justified by Christian theology that sincere Christians participated in. This was not a small imperfection in otherwise sincere believers and these were not insincere believers. Christianity and racism are not mutually exclusive. This photograph is from the early 1920’s near Portland, Oregon. 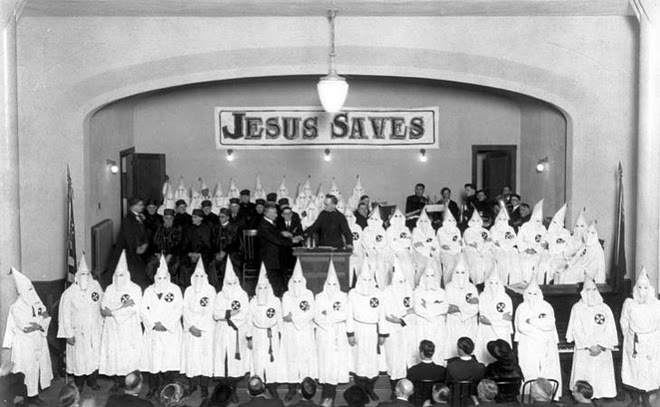 While obviously I would not judge all Christians by the KKK’s stance, it cannot be denied that the KKK were started as an anti-black and anti-Catholic Protestant organization. Their stress was on 100% “Americanism” which to them meant being Protestant and White. (Most likely) killed by Christians. 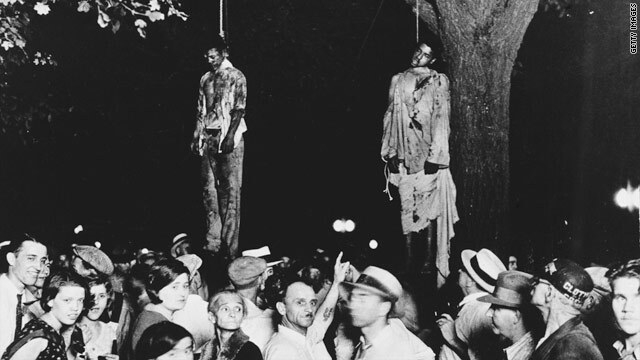 This is a photo taken in Marion Indiana in 1930 at the lynching of two black men. Marion Indiana is currently 75% white and home to the largest Christian university in the Midwest. While I cannot know for sure, statistically speaking most of the people in this photograph, including the man smiling in the lower left, were probably Christians. Again, statistically speaking most of the lynchings that took place in the South were perpetrated by people who went to church the next Sunday. Most of these people would self-identify as Catholic or Protestant. Moving forward in time again, Rwanda was touted as a model for missionary success and most Rwandans would self-identity as a Catholic or Protestant. However, Belgian Christian colonists exacerbated existing divisions among Rwandans to make Rwanada easier to rule and exploit. 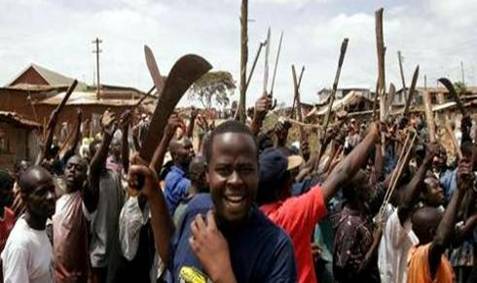 The artificial distinction between Hutu and Tutsi created by these Beglian Christians directly led to the massacre in 1994. Christians also actively participated in the Rwandan genocide. To make this statement a little bit more real, here is a quotation from an Adventist Christian and choir member who participated in the Rwandan genocide. While it is admirable that his faith was part of the reason he stopped, his Christian faith was sincere enough to get him to be an active participant in his church but apparently not enough to stop him from participating in genocide. 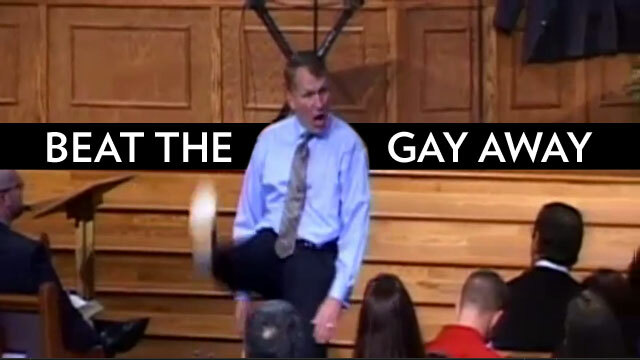 Sean Harris, the pastor and spiritual leader of Berean Baptist Church in Fayetteville advocated that parents beat the homosexuality out of their children if their boys are too effeminate or their girls are too butch. (Source: Jezebel) Around the same time Charles L. Worley, the pastor and spiritual leader of Providence Road Baptist Church in Maiden, N.C. advocated for rounding up homosexuals and surrounding them with an electric fence so that they will die off. (Source: Yahoo) Both of these pastors sermons were met with applause and “amen’s” from their congregation. No one, no matter how sincere or sentimental in their faith, is categorically prevented from participating in or supporting injustice, evil and oppression that are directly opposed to the Way of Jesus Christ. Sincerity of faith is not an inoculation against participating in evil. Just because we are devout or sincere in our affection towards Jesus and our commitment to pursue righteousness does not guarantee that all of our practices and beliefs, even commonly and widely accepted ones, are in fact righteous and just. Because of this reality, Christians need to seriously consider that if followers of Jesus got it way wrong in the past, that we might have it way wrong today. In light of all this we need to be less concerned with perpetually justifying ourselves and more concerned with prayerfully, scripturally and carefully examining the current beliefs and practices of Christian culture that we participate in, no matter how time honored or common sense they are to us. We need to stop protecting and enshrining evils and injustices that are part of the current status quo in Christian culture all the while pretending or truly believing we are defending God or the Christian way of life and faith. We need to do this because history has shown that just saying, feeling or professing to really love or believe in Jesus is not enough to ensure you are actually following and obeying the Way of Jesus. This entry was posted in Christianity, Personal Commentary and tagged Abu Ghraib scandal, Christian culture, Christian evil, Christian oppression, Christianity, Christopher Columbus, colonialism, homophobia, injustice, KKK, Native American genocide, racism, Rwandan genocide, sincerity of faith, systemic injustice. Bookmark the permalink.